Thanks to you the entire picture of the rug is displayed once the page loads. RND 1: Ch 4, work 11 dc in 4th ch from hk. Join with sl st in top of beg ch 4. Ch 3, Do Not Turn. RND 2: * 2 dc in next dc. Repeat from * around to last dc. Work 1 dc in the same sp as beg ch 3. Join with sl st in top of beg ch 3. RND 3: Sl st in between next 2 dc. Ch 3, dc in same sp. * Ch 1, sk next 2 dc, 2 dc in between the 2nd and 3rd dc (just to the left of the 2 dc you skipped). Repeat from * around. Ch 1 after last 2 dc, join with sl st in top of beg ch 3. Ch 3, Do Not Turn. RND 4: Dc in next dc, ch 2, * dc in next 2 dc, ch 2. Repeat from * around to end. Ch 2, join with sl st in top of beg ch 3. Ch 3, Do Not Turn. RND 5: Dc in next dc, 3 dc in next ch 2 sp, * dc in next 2 dc, 3 dc in next ch 2 sp. Repeat from * around. Join with sl st in top of beg ch 3. Ch 3, Do Not Turn. RND 6: Dc in next 2 dc, 2 dc in next dc (this is the middle of the set of 3 dc on previous row), * dc in next 4 dc, 2 dc in next dc. Repeat from * around to last dc. Dc in next dc, join with sl st in top of beg ch 3. Ch 3, Do Not Turn. RND 7; Dc in next 2 dc, * ch 3, sk next 2 dc, dc in next 4 dc. Repeat from * around to last 3 sts. Ch 3, sk next 2 dc, dc in next dc, join with sl st in top of beg ch 3. Ch 3, Do Not Turn. RND 8: 2 dc in next dc, dc in next dc, * ch 3, sk next ch 3 sp, dc in next dc, 2 dc in next dc, 2 dc in next dc, dc in next dc. Repeat from * around to last ch 3 sp. Ch 3, dc in next dc, dc in same sp as beg ch 3, join with sl st in top of beg ch 3. Ch 3, Do Not Turn. RND 9: Dc in next 3 dc, * 4 dc in next ch 3 sp, dc in each of next 6 dc. Repeat from * around to last ch 3 sp, 4 dc in last ch 3 sp, dc in next 2 dc, join with sl st in top of beg ch 3. Ch 4, Do Not Turn. RND 10: Sk next dc, sl st in next dc, * ch 4, sk next dc, sl st in next dc. Repeat from * around placing the last sl st in the same sp as beg ch 4. "Hi, thanx for the great web site. 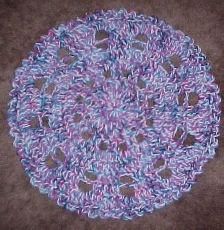 I am going to make the doily using two strands of thread to get it a little bit bigger. When it is done it'll be a bread cloth. Thanx again!!! 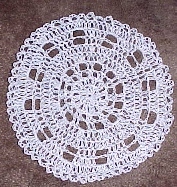 Flo"
"The doily came out to about 15" diameter. I just repeated rnds. 2 - 9 once and then finished with rnd. 10. It is very ruffled though. You might be able to figure that part out. My daughter and I volunteer at an historic village. We wear costumes from the 1800's. I needed something to cover my bread basket. Crocheting has been done forever so this was perfect. I'll be back to the site again and will vote for you then too. Thanx again. Flo"
Thanks Flo for such a wonderful idea!